Over the holidays, I finally egged up and cut into one of the merino wool knits Steph of 3 Hours Past bought on my behalf last winter, since they are apparently abundant and luscious down under. Unfortunately by the time the postal snails got the fabric to me, it was spring, and I figured I had better wait until the weather gods were speaking Woolish again. Though really, I shouldn’t’ve waited, because now winter is half gone (hopefully) and there’s still three other pieces not even cut into. 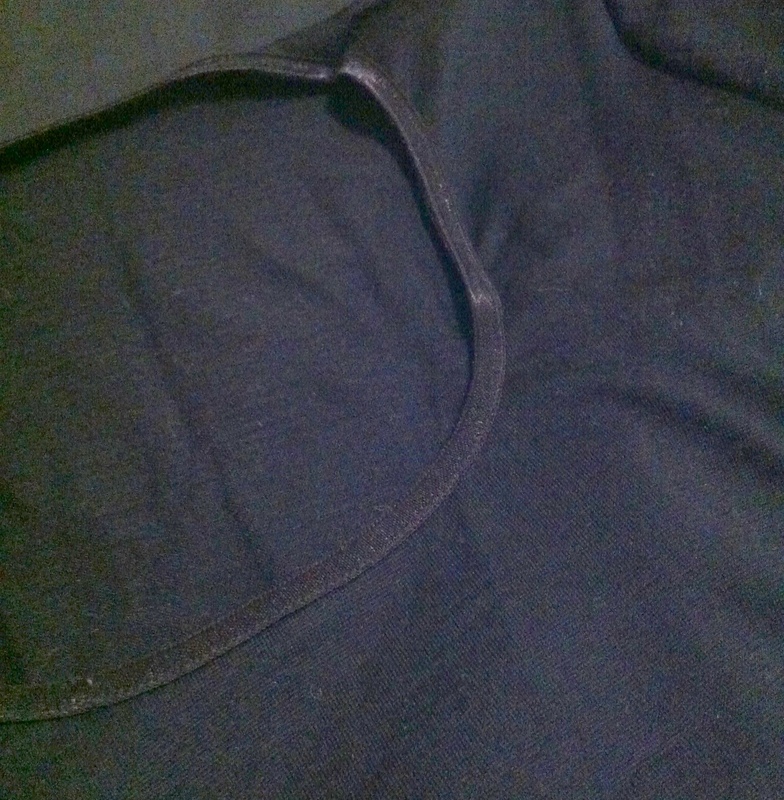 Anyway, I agonized over what to do with this beautiful, lightweight black jersey. I BELIEVE it’s the same stuff Steph made her Little Black Red Velvet out of, which is absolutely delicious, and I was sorely tempted to imitate her completely. Sadly, at the last moment, I choked, and took the safe route—I made up yet another version of my knit sloper. This means that, aside from being wool and not cotton, it’s functionally identical to the two black knit tops I made WAY BACK when I was first working out the kinks of the pattern. Both of which are still in rotation, by the way, although one has seriously gibbled shoulders and the other one, which may never have been blogged, has a teeny, mended hole that really annoys me whenever I find it (although I usually can’t find it, which is why the top remains in rotation.). 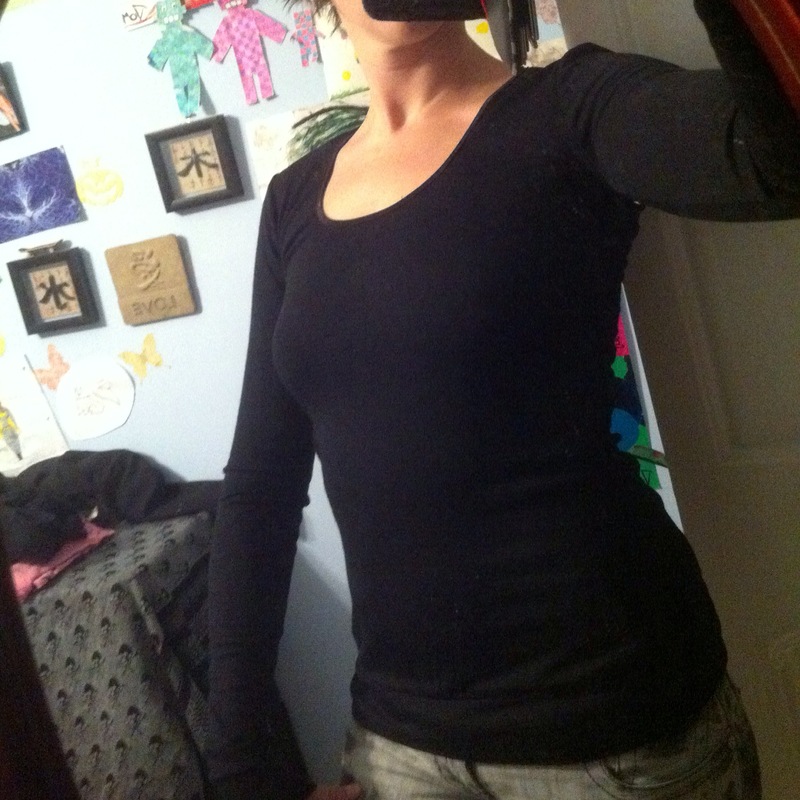 I managed to finish this top just in time to go back to work, which, combined with a vicious dose of Saskatchewan Winter (which had been remarkably mild through most of December), meant that I actually wore all three black shirts three days in a row. And then had to explain to everyone, by the third day, that no, it actually wasn’t the same shirt three times. I am happy to report, it makes a pretty damn yummy shirt. The merino isn’t as soft as cotton or rayon to touch, but it ain’t bad either. At least, I don’t find it itchy, though I’m not particularly sensitive to such things anyway. 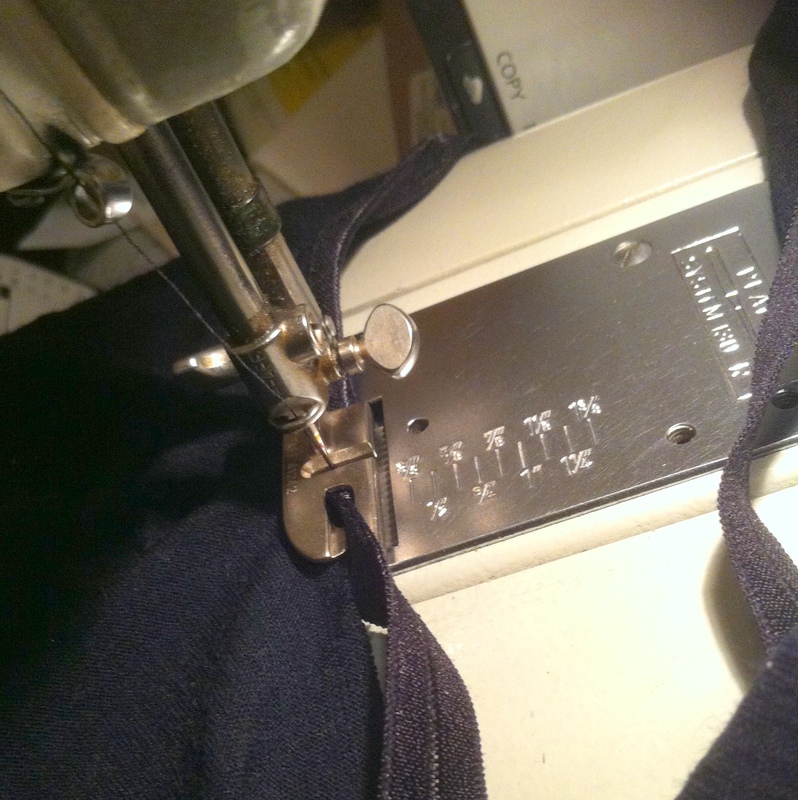 I added a band to the hem, because I love that finish, and I used 1/4″ fold-over elastic to finish the neckline. For those of you who are epically long-haul readers (and have really, really good memories), you may realize how much of a triumph that actually was. I purchased a small shitload (I think about 4m?) of this stuff maybe three years ago from the random-fabric-dive in Cow Town, and I’ve mangled pretty much every attempt to use it, fairly badly. 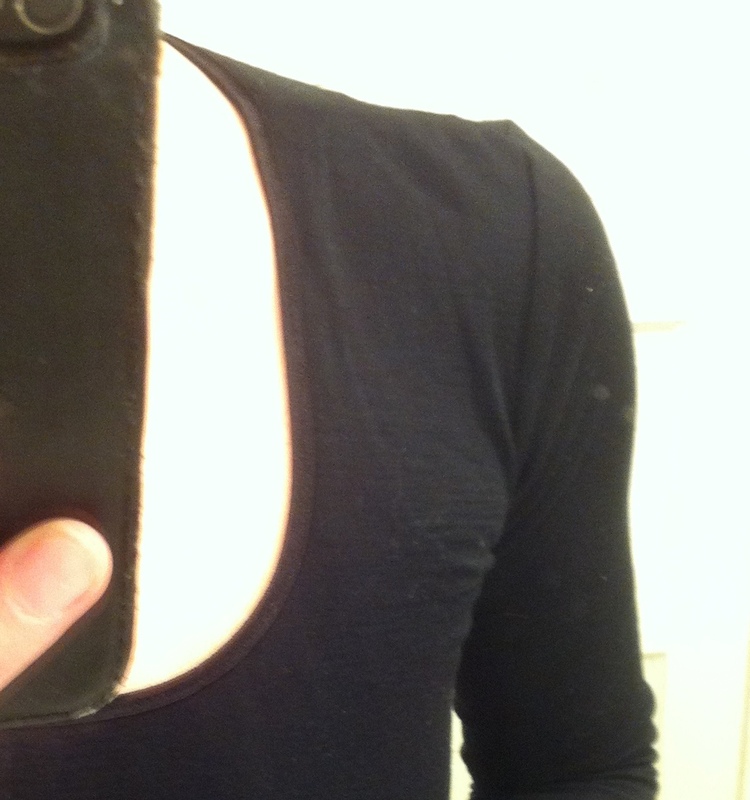 It’s not pre-folded… I talk about one attempt to use it here (but was too traumatized to actually show the tank-top) and I used it on this tank-top for me, which is at least wearable if not pretty, and gets regular use in the PJs-and-undershirts rotation. But I’d never been able to get it go on in one pass, and a second pass just mangles it pretty badly. While musing about how to finish the neckline for the merino top, I ran across the last metre or so, lurking sulkily amidst my elastics. And I was thinking about how to apply it in a single pass, as seems to be preferable (I’m pretty sure Cloth Habit has a post on applying this stuff somewhere, but I couldn’t find it). 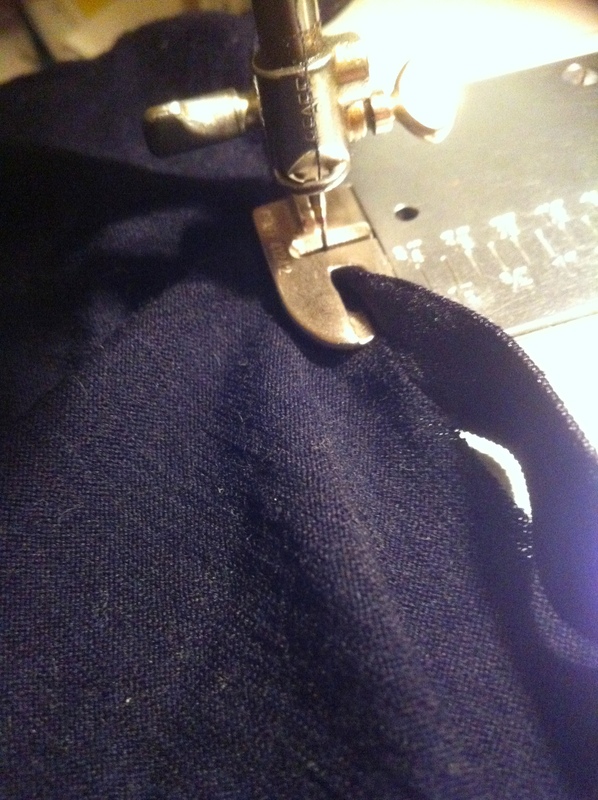 Anyway, I was trying to think about sewing machine feet that would help, like a binder, with folding it over for me. Almost like what a rolled-hem foot does, but without the extra roll. Actually… pretty much like the flat-felling foot does. Can you see it any better? not really. 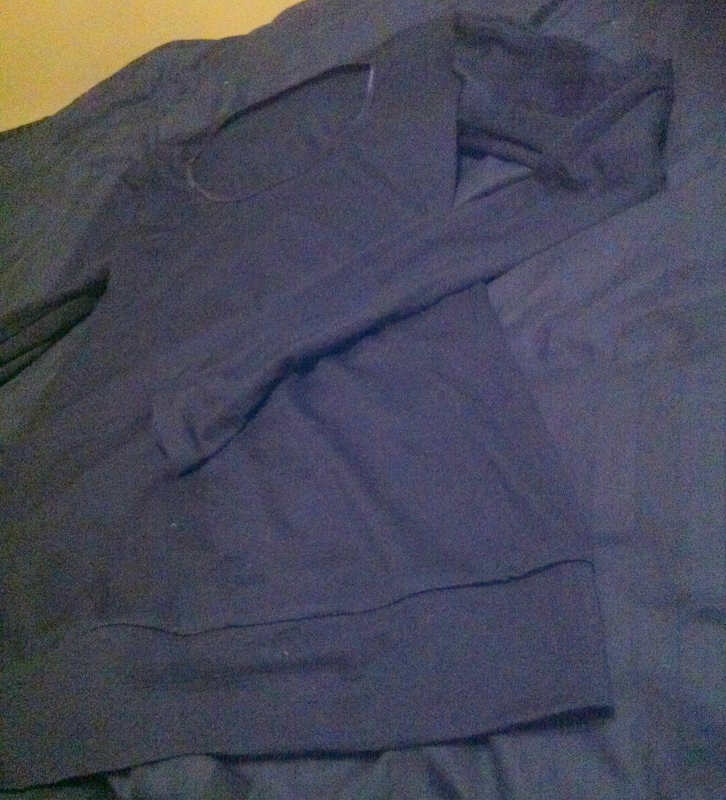 Finished neckline, flat. Even crossing the shoulder-seam wasn’t a big deal. Can you see it? Not really. and on me—even flatter. 🙂 There are a couple of wrinkles when it’s loose, but nothing I’m going to whine about. It’s on, and it worked. But at least I have a pretty sweet (if completely boring) shirt. Ooo, good idea, using the fold over elastic on a knit top, I never thought of that. Looks really good! Isn’t it amazing how the most boring makes are usually the most used? I saw one Facebook post about the weather you did earlier this month and wondered how anyone puts up with such low temperatures… Certainly, lots of warm layers are a major priority and wool is supposed to be way better at that than cotton. Your top looks good and usually the ‘boring’ items are the most useful. And about that elastic… From your description, I first thought it was something I’m not familiar with but I recognized the stuff in the pictures. This is the same kind of fold-over elastic I can buy here. I’ve never had much trouble with it though. And I keep being surprised at how hard it is to find this stuff in a lot of places. It seem every haberdashery place in my parts stocks it in several colours… If I did’t know shipping costs across oceans and continents get pretty high, I’d offer to send you some. It’s not really uncommon stuff, I think—I’m not quite sure why it’s so expensive locally. Twice, almost three times the price of a similar but much thicker elastic—so weird. How do you usually put it on? I have never managed so apply fold over elastic well, even the pre-folded stuff, so I am impressed! When I bought my machine I got to pick a few feet at a discount and bought 2 sizes of flat felling feet that I’ve NEVER even taken out of the box (that finish is too fussy for me, I’d rather fake it.) Now I know what to use them for! Thanks! Nice lightbulb moment. I love a good epiphany. Did you want more FOE? I live in Calgary and am heading to Saskatoon this weekend… Did you get it at Designer Depot (craziest store ever)? Send me an email. You’ve convinced me. I need a flat-fell foot! Whoa. You are genius! Foldover elastic is suddenly harder to find by the yard/metre in Seattle. Which is going to hit 59F again today. Which means no water this summer. Ew. I love merino, the store called “The Fabric Store” here in LA is an outpost of the Kiwi store, and sell the most lovely merino jersey. I have used a binding attachment for woven binding, but never thought to use it for fold over elastic, that is totally genius! Not boring at all! Great neckline.